According to Martin Harrison and Bill Waters, this "painting became synonymous with the artist, and was reproduced time and time again. It represents a king who, after searching far and wide, found his ideal, a beautiful soulful maiden who hovers between life and the spirit world. . . . Cophetua appreciates this and sits, gently absorbed by her presence; it is a moment of magic when time is stopped and the world is transmuted into an eternal stillness" (141). King Cophetua and the Beggar Maid, in other words, provides a painterly version of the Rossettian perfect moment of frozen time captured in "Silent Noon," "The Woodspurge," and other poems. 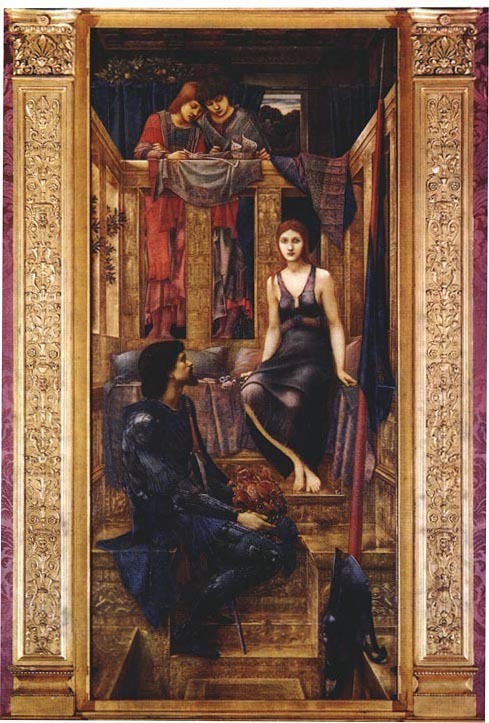 Burne-Jones, we may say, began his career as an apprentice to Rossetti, creating early works that looked like copies of his master's medieval subjects. Late in his career, when he has achieved a painterly style completely different from Rossetti, he yet uses it to depict a Rossettian theme. Harrison, Martin, and Bill Waters. Burne-Jones. London: Barrie & Jenkins, 1973. Lambourne, Lionel. The Aesthetic Movement. London: Phaidon, 1996.